There are two things I constantly bemoan about Japanese cuisine here in Toronto: 1) The lack of a good Japanese ramen shop, and 2) the lack of izakayas. 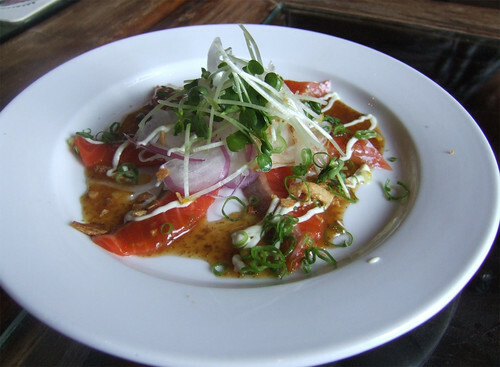 We're a town filled with lots of sushi restaurants, some not-so-good and some absolute gems. But aside from your sushi and your typical teriyaki/bento box fare, there's not more diversity in Japanese cuisine. 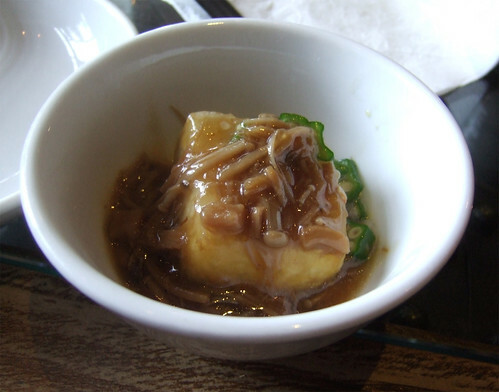 And yet Japanese cuisine is so much more than sushi, teriyaki, tempura, etc. So when I was walking around Vancouver, particularly in the Robson/Denman area, I was thrilled to come across so many different Japanese restaurants: ramen shops, izakayas (a kind of Japanese "tapas bar"), yakitori grill houses, and more. It was wonderful to see all the choices, but also made it hard to decide where and what I wanted to try. I ended up walking into this tiny little shop called Motomachi Shokudo, a tiny little ramen shop that can seat about 20 people or so. 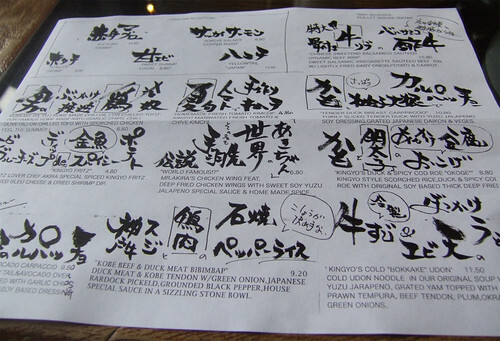 The menu is small, featuring only about a half dozen or so different kinds of ramen, plus a few additional appetizers. 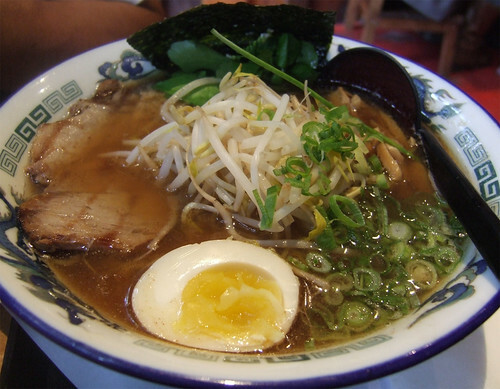 We had to order a classic Japanese ramen: shoyu BBQ pork ramen. Their own homemade chicken stock seasoned with soy sauce to give it its lovely brown colour and served with their own house-made BBQ pork. 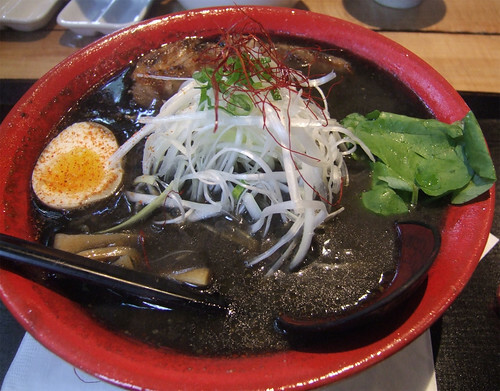 But frankly, it was their unique bamboo-charcoal dark miso ramen that totally got my attention. What the heck is bamboo-charcoal doing in food? Apparently, it has some great health benefits. **shrugs** I just know that the soup base for this, while a totally appealing charcoal black, is so full of depth in flavour. A truly unique ramen. Next on my must-try list was an izakaya. I was thrilled when Guu finally opened up in Toronto last fall, but I have yet to try it due to time and the lines I hear about if you get there late. Goes to show how sorely lacking we are of izakayas in the city, despite a few more so-called "izakayas" having crept up here and there in the past few months. While in Vancouver though, I decided to skip Guu and head to Kingkyo instead. The Sockeye salmon catch this year has been beyond excellent for B.C. fisherman, and what better than to enjoy some beautiful local sockeye while I was here in Vancouver? Absolutely lovely and refreshing with the yuzu and soy dressing and the garlic and shaved onions for texture and bite. I love tofu, so this dish was screaming my name. Deep-fried tofu come to the table in a sizzling stone bowl, where our server poured over a sauce made with mushrooms, dried scallops and okra. As we watched it sizzle and bubble on the middle of the table, we were hit with all the incredible smells, especially from the dried scallops and bonito flakes. Delightful! After doing a little digging around, I found out that "okoge" is the Japanese term for the toasted rice that is found at the bottom of the rice cooker, which apparently, is considered very undesirable amongst Japanese cooks. 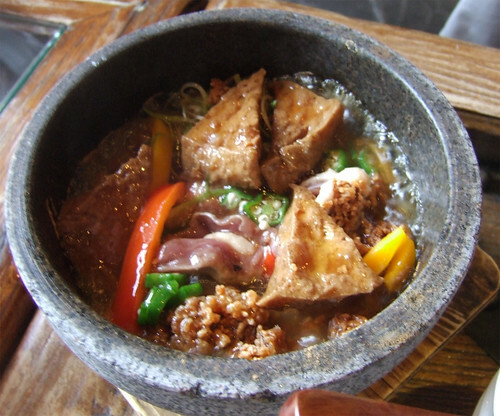 However, that toasted rice part is what the Chinese consider the best part, and is highly prized in claypot rice. You know you've made it white when you have perfectly cooked rice in the center, and a perfect, golden crust at the bottom. Super crunchy with a smoky, slightly burnt taste, this dish was so lovely with the silky duck meat and the savoury sauce, which the "okoge" soaked up. The Japanese are known for their Kobe/wagyu beef, and while I don't see what all the fuss is about (can you tell I'm not much of a beef-eater? ), I still had to give this one a whirl. 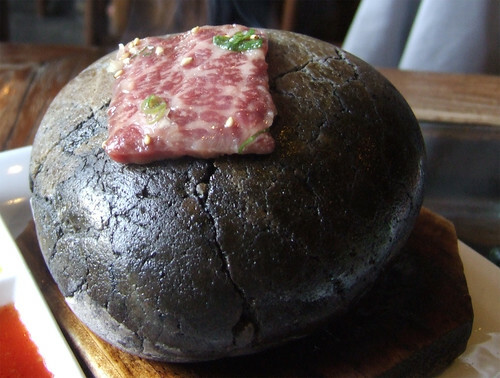 Mostly for the novelty of cooking my food on a hot stone! The sophisticated caveman approach to cooking?! A pretty standard dish on many Japanese menus, but I had to give the Kingyo a try. Beautiful, perfectly cooked piece of fish. 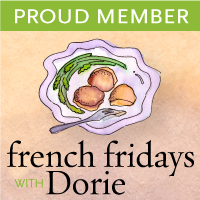 Stay tuned for the last part of my journey to gaining ten pounds in a week as I head off to the markets! Melissa October 5, 2010 at 5:03 p.m.
Amen about the lack of ramen and izakayas! Call me crazy but I think Vancouver stopped all the Japanese immigrants from coming to Toronto hah. Nice blog and post by the way! Andrew and (formerly) Bonita October 7, 2010 at 10:07 a.m. The most obvious and outstanding feature about wagyu beef is the extensive marbling of the fat in the meat. ("Kobe" apparently refers to the particular method of raising a particular breed of wagyu beef.) I remember having some wagyu carpaccio in Melbourne, and I did find that the meat had a softer, smoother texture than beef typically found in Canada, most likely due to the marbling.